Not only the site of the huge annual Nazi party conventions, but of course also the Nuremberg Trials. 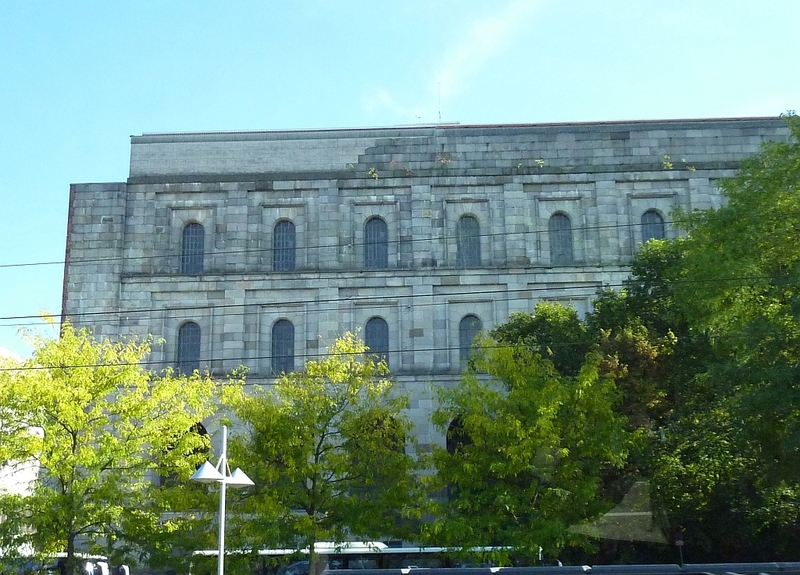 We started the day with a driving tour of Nuremberg which took us to the Nazi party rally grounds, starting with Congress Hall. This unfinished building was part of the Nazi rally grounds. It was commissioned by Hitler and intended to hold 50,000 people. 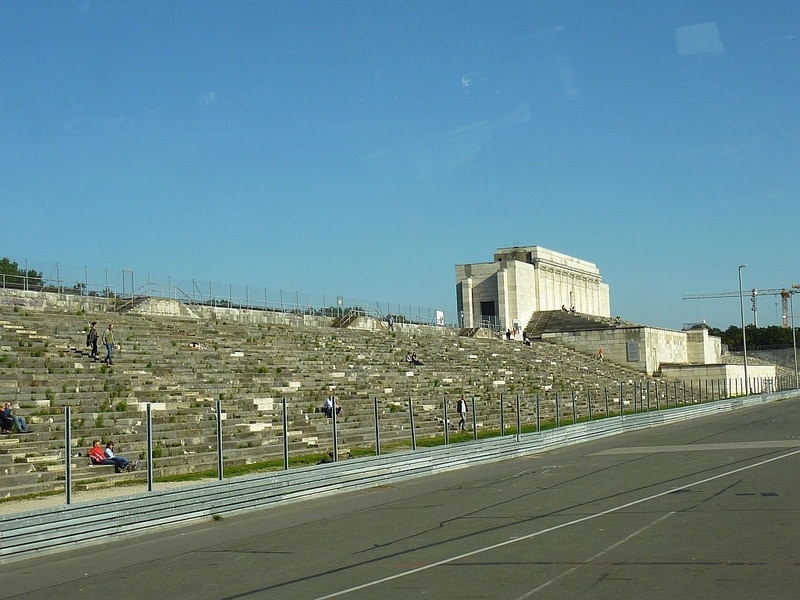 We also saw Zeppelinfeld (Zeppelin Field), the Nazi grandstand. At the far right of the photo is the speaker’s stand, where Hitler stood to address the crowds. 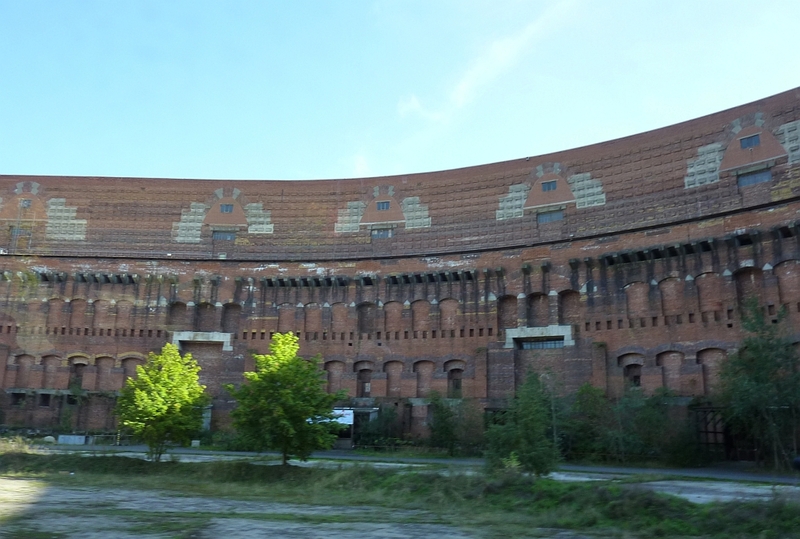 Most of the rally grounds didn’t affect me as more than just old buildings, but I found the Zeppelinfeld to be strangely eerie – perhaps because of having seen historical photos of it from the Nuremberg Rallies. 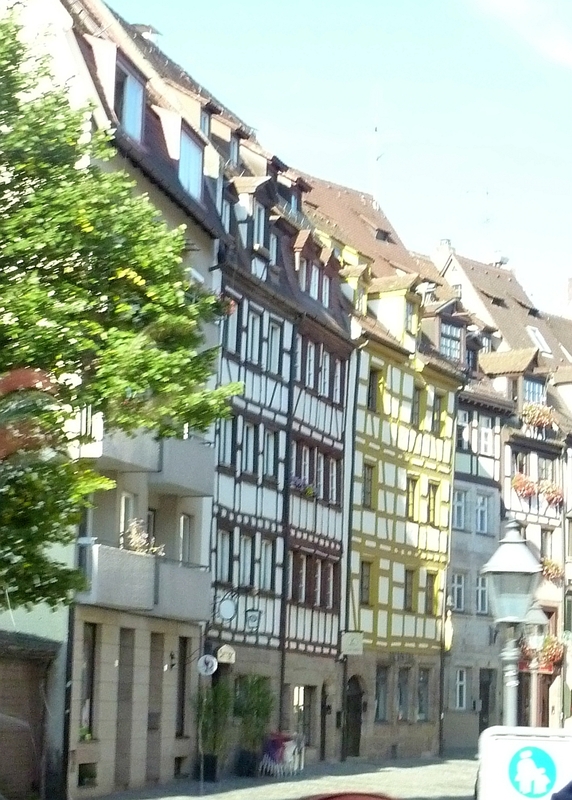 The Hauptmarkt (market square) in the center of town was a busy place with booths set up for the daily market. 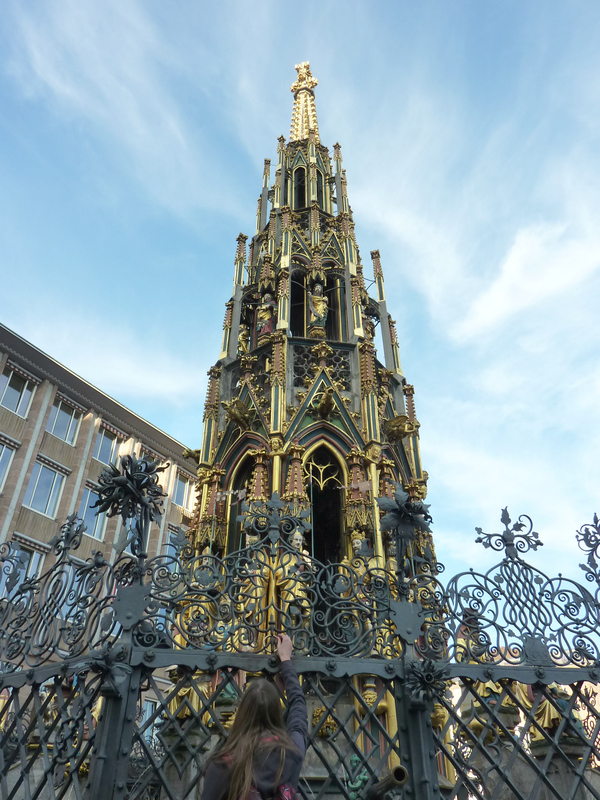 One of the focal points of the square is the Schöner Brunnen (“beautiful fountain”), which really is beautiful. It’s much more colorful than it appears in my photo. Mounted on the ironwork protecting the fountain is the Nuremberg Ring, a gold-colored ring which is supposed to grant your wish if you spin it, as the young woman in the photo above is doing. 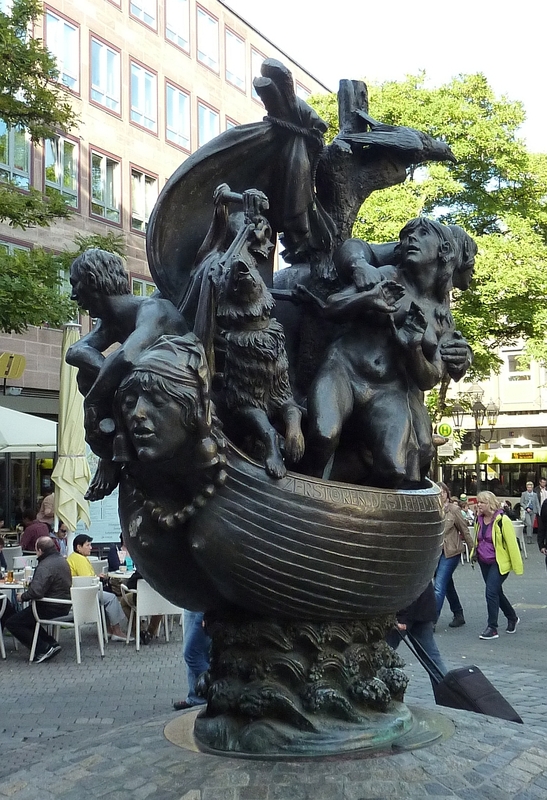 One of my favorite things in the market square area was this sculpture called “Ship of Fools”. It’s based on the satire “Ship of Fools“, written by Sebastian Brant in 1494, which was critical of the church. According to Wikipedia, the name “Ship of Fools” was “inspired by a frequent motif in medieval art and literature, and particularly in religious satire, due to a pun on the Latin word “navis”, which means a boat and also the nave of a church”. Who knew? One thing I didn’t get photos of was the delicious food. 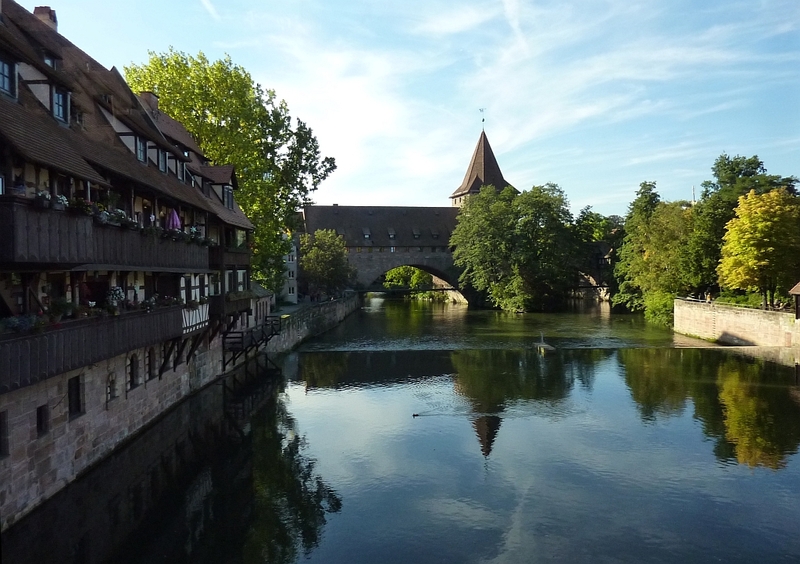 Nuremberg is famous for their Nürnberg sausages and their Lebkuchen, which is sort of like gingerbread, flavored with candied lemon and orange peel, but made in rounds like large cookies. We had the Elisen Lebkuchen, which is made without wheat, and I thought it was better tasting than the regular version. Most likely the ones you buy are not gluten-free, though, since traditionally they are baked on top of baking wafers called Back-Oblaten, which are similar to communion wafers. The wafers are used not only to keep the cookies from sticking to the pan, but supposedly also help keep them moist longer. But you can always make your own without the wafers – a traditional recipe can be found here. A few more photos can be found in my set here. This entry was posted in Uncategorized and tagged Europe, Europe2013, Food, Germany, Travel. Bookmark the permalink. You really did travel to some very interesting places on this trip! I have learned more about Europe from your trips than I have from reading books. It’s next best to being there. You share very interesting tidbits from each area and your posts create in me the desire to learn more. Fascinating! And beautiful, too. I love the Ship of Fools statue! I LOVE lebkuchen but I’m going to try your linked recipe!